At Wright State University, faculty and students are joining forces in innovative curricula that improve teaching effectiveness by providing hands-on learning. “Service-learning engages students, faculty, and community members in a partnership to achieve academic learning objectives, meet community needs, and promote civic responsibility for all parties involved,” explained Cathy Sayer, director of Service-Learning and Civic Engagement at Wright State. One of the faculty leaders in service-learning courses is Hunt Brown, director of sustainability and senior lecturer in Earth and Environmental Sciences. The devastation left after Hurricane Katrina provided the backdrop for his first service-learning course, titled “Working Toward Sustainability.” The 2007 Honors intersession course dealt with sustainability issues as they related to post-Katrina cleanup in New Orleans and culminated with a trip to the ravaged area. Brown and his students put attic insulation into homes that survived Katrina in the hard-hit Lower Ninth Ward. The experience was life changing. This spring break, a group of Honors students and freshmen will travel to New Orleans as part of a course titled “Rebuilding New Orleans/Campus Community Connections.” The class, taught by Brittany Boyne, Dayton projects coordinator for Ohio’s STEM Ability Alliance in the College of Science and Mathematics, and Galen Crawford, student activities graduate assistant for programming and community service, examines the Hurricane Katrina tragedy as highlighted in the 2011–12 Wright State Common Text, Zeitoun. The social justice studies will give students a hands-on experience of helping to physically and emotionally rebuild a city. Brown also has incorporated a trip to Appalachia into a service-learning course that he co-teaches with Sarah Twill, Ph.D., associate professor of social work. Since 2010, students in the Honors course “Environmental and Social Sustainability in Appalachia” have spent their spring breaks participating in service projects in rural Appalachian communities near Athens, Ohio. The course introduces students to the environmental, social, and economic challenges affecting the people of Appalachia. They partnered with Good Works, a social service organization in Athens, which helped coordinate the group’s activities with other community partners. 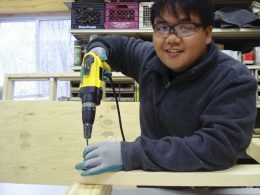 Students assisted low- and fixed-income seniors and people with disabilities with home improvement and repairs. While visiting with the homeowners, students learned their personal stories and family histories. Another activity involved working with the Monday Creek Restoration Project, an organization seeking to reduce the impacts of acid mine drainage on area waterways. “The trip was interesting because it had us interacting with a variety of people, helping out with various needs, and just immersing us into the Appalachian way of life,” remembered Christian Cone-Lombarte, a senior Mechanical Engineering major who went on the 2011 trip. For Brown, developing an affinity for the Appalachian people was one of the greatest benefits of the trips. “We want our students to understand the people in Appalachia the best they can in the short period that they are down there,” he said. Through service-learning, he noted, “You learn their stories, and the social, economic, and environmental challenges they face.” Both he and Twill believe that this familiarity breaks down stereotypes, builds empathy and trust, and inspires students to become more involved citizens. “When you’re teaching with service-learning, the students bring what they’re experiencing into the classroom,” Sayer pointed out. “They tell you their stories. They tell you what they are learning from it right then.” Understanding the social issues surrounding the problems that community partners are trying to solve enhances these experiences. Service-learning experiences help students develop important skills, such as problem solving, critical thinking, communication, and collaboration, Sayer added. It often helps them decide what major is right for them. Community members tell Sayer that they value the energy and vitality that service-learners bring to their organizations. “We have to get students out there in the community and let them see the assets, problems, and issues for themselves,” she noted. For her capstone project, Purvis focused on troubled youth, evaluating a gardening project at Miami Valley Juvenile Rehabilitation Center. After graduating with a bachelor’s in social work, she was hired as the service-learning and civic engagement coordinator for youth and literacy programs at the university. Today she is the liaison with Westwood PreK–8 School in Dayton, where over 200 Wright State students tutor and volunteer annually. Service-learning projects across campus are helping to solve problems. A public relations class provided research for Energize Clinton County after DHL, the area’s major employer closed, eliminating 8,000 jobs. While working on her Master of Public Administration degree, Lindsey Jarvis interned with East End Community Services. Her service-learning capstone project was instrumental in getting a grant that helped create Dayton Works Plus, a deconstruction and job training program. She is now a program coordinator with East End Community Services.